Lentils (Lens culinaris) are legumes, related to beans and peanuts, and to some comparable to dried split peas in appearance, although they are not as sweet. Botanists believe they originated in the Near East and were likely one of the first domesticated crops there. This is important given their nutritious nature. Like beans they have a high protein content, about 26%. In fact, the only legumes superior in protein to them are soybeans. People grow lentils throughout much of the world, and you're most likely to find them in dried form. When they're harvested, they're removed from pods, making them essentially seeds of the lentil plant. You'll find them in many varieties and in a plethora of colors. Many may be familiar with slightly tan colored or green versions, but you can also find them in various shades of red, orange, golden and even black. There's not significant difference between the varieties in terms of taste, though green lentils are somewhat nutritionally superior to other forms because they tend to have a higher dietary fiber content. Unlike dried beans, lentils do not require pre-soaking overnight prior to being cooked. Instead, most cooks recommend that you first pick over these UFO shaped legumes, and remove any that look broken or damaged. Cooks recommend rinsing them too. If you'd like to save the trouble of cooking, you can sometimes find these legumes canned. You'll find lentils in a variety of dishes, all over the world. They're a hearty addition to soup or stew, and they may be featured as the main ingredient in Indian food like dal. Middle Easterners include them in a vast number of different meals, including the popular Mejadra, which simply means rice and lentils. These two ingredients are often combined in dishes since they have approximately the same cooking time and that combined with rice they form proteins that the body needs. One of the reasons cooks favor lentils is that on their own they do not have strong flavor. They do a great job of absorbing flavors and spices, so if you're preparing any lentil dish, know they will taste about the same as the strongest flavors in that dish. In the US, we're often accustomed to eating these legumes hot, and thinking of them as one of the great comfort foods, but they're also excellent when added to salads and served cold. You could serve them in a vinaigrette, or add them to dishes like tabouleh for a refreshing summer dish. In regards to nutritional quality, these legumes are a superior food. In addition to being composed of about 26% protein, a single serving of lentils, about half a cup (about 113 grams) uncooked, has 60% of the recommended daily allowance (RDA) of iron, 67% of the RDA for Vitamin B1, and a whopping 31 grams of dietary fiber. The high fiber content may be instrumental in helping to reduce total cholesterol, and can easily help you meet recommended daily requirements for fiber. They're an excellent food, adaptable to many dishes, and certainly rank as one of the most nutritious foods available in the human diet. Lentils are rich in protein, with over 25% of lentils nutritional value being protein. This makes lentils the most popular and inexpensive source for protein, especially for those, who cannot afford meat and for vegetarians. Apart from proteins, lentils have essential amino acids, dietary fiber, folate, other vitamins and minerals. 200 grams of cooked lentils contain 18 grams of protein, 40 grams of carbohydrates, 15 grams of dietary fiber, 4 grams of sugar and 138 grams of water. Calorie content in lentils is around 230 (for 200 grams of cooked lentils). The following table can give you detailed information about the lentils nutrition facts. Now, you know the nutritional value of lentils, which offer various health benefits. Lentils, being a rich source of dietary fiber, is beneficial for lowering cholesterol. This fiber content also prevents the sudden hike in blood sugar levels after a meal. It is also good for preventing digestive disorders, like, irritable bowel syndrome, diverticulosis and constipation. Apart from lowering cholesterol, lentils are also good for the health of the heart, as it contains significant amounts of folate and magnesium, which inhibits the damages to the artery walls. The high levels of magnesium in lentils is also good for cardiovascular health, as it enhances the blood flow in the body. Lentils have good iron content, which is considered as an energy supplier. As it contains flavonoids, lentils are also good for preventing cancer, especially breast cancer. Lentils nutritional value or the nutrients in lentils are responsible for the various health benefits associated with it. So, you can relish the different lentil recipes, at the same time enjoy the health benefits of lentils too. 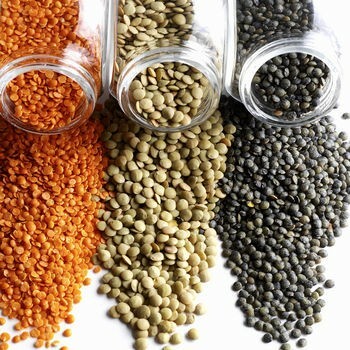 Diabetics may be interested to know that the soluble fiber in lentils traps carbohydrates. This in turn slows digestion and absorption, which helps to prevent wide swings in blood sugar level throughout the day. Due to their high levels of fiber, lentils increase the size of stool, which speed the journey of waste products through the gut; this means they are great to help alleviate constipation. Fiber can also help both reduce the risk and the symptoms of diverticulosis, a condition in which small pouches form in the colon wall (usually from the pressure of straining during bowel movements). A study carried out by the Department of Nutrition at Harvard School of Public Health, Boston has shown that diets high in lentils and peas (which both contain high levels of flavones) have a reduced risk of breast cancer. These studies are not exhaustive, but have certainly thrown up some food for thought. The intake of dietary fiber, particularly from lentils has been known to reduce the risk of coronary heart disease. Consuming too many lentils may have health consequences, such as increased flatulence, amino-acid side effects, kidney distress and potassium toxicity. Some people may also experience an allergic reaction. Lentils contain 4 grams of fiber per 100-gram serving, according to Purdue University. Multiple servings of lentils can cause flatulence, as fiber is not digested in the small intestine and must be broken down into gas by the large intestine. In addition, lentils contain antinutritional elements that the body cannot digest, such as hemagglutinins, oligosaccharides and trypsin inhibitors. When too many of these antinutritional elements are consumed, excess flatulence results. Oligosaccharides are prebiotics, or indigestible food ingredients that increase good bacteria growth. They can cause flatulence, stomach cramping and intestinal discomfort from the gas released during fermentation, according to the University of Nebraska-Lincoln. Lentils contain lysine, an essential amino acid that aids in the maintenance of growth, the preservation of nitrogen, the absorption of calcium and the conservation of lean body mass. Lysine can also inhibit the growth of the herpes virus, and it may improve athletic performance, according to James Madison University. However, if you consume high quantities of lysine, this amino acid may cause gallstones, increase your cholesterol levels, and result in kidney impairment. In addition, notes the university, lysine taken in very high doses -- 15 to 40 grams per day -- can cause abdominal cramping and diarrhea. One cup of lentils contains 18 grams of protein, according to Harvard School of Public Health. Your body needs approximately .8 grams of protein per kilogram of body weight. However, too much protein consumption may increase your risk of developing kidney disease. According to the Harvard University Gazette, a high-protein diet tends to accelerate kidney dysfunction, compared to a low-protein diet. A high-protein diet places extra stress on the kidneys to process proteins and filter waste out of the body. Over time, this extra stress can damage the kidneys and impair kidney function. Potassium contributes to the functioning of the heart, the nerves and the muscles. However, when excess potassium enters the bloodstream, hyperkalemia can occur. Hyperkalemia may produce no symptoms, or it can cause symptoms such as fatigue, weakness, irregular heartbeat, respiratory problems, vomiting, tingling and numbness. A high-potassium or high-protein diet can cause hyperkalemia, according to the University of Maryland Medical Center. Consuming too many lentils, a rich source of protein and potassium, can contribute to the development of hyperkalemia. Lentils are classified as legumes, which puts them in the same family as beans and peanuts. That means if you have a peanut allergy, you may also be allergic to lentils. Fortunately, you can take care of yourself by watching your symptoms carefully and choosing to eat other plant-based proteins instead. According to the Allergen Bureau, a test among Spanish children who demonstrated a legume allergy showed that the most common symptoms were respiratory in nature, including asthma and rhinitis. Skin reactions were also present in some children. The European Union's InformAll allergy database also notes that oral allergy syndrome, hives and rashes can occur, and in severe cases, an individual who is allergic to lentils may experience anaphylaxis and require urgent care. If you are especially sensitive to lentils, you may even note symptoms in response to inhaling steam from cooking the food.